Manchester United got their 2016/17 season to a winning start while Liverpool fired four past Arsenal to also get an opening win. Manchester United beat Bournemouth 3-1 with Juan Mata opening the scoring in the 40th minute. 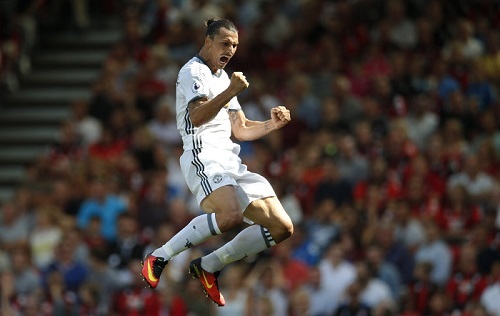 Wayne Rooney doubled the lead in the 59th minute before Zlatan Ibrahimovic wrapped up the win scoring on his United debut. At the Emirates stadium Arsenal’s makeshift defensive pairing of Calum Chambers and Rob Holding found the going tough against Liverpool. Theo Walcott gave Arsenal the lead in the 31st minute as he made up for an earlier penalty miss. Coutinho levelled matters with a stunning free kick just before half-time. In the second half Liverpool took control with Lallana putting the visitors ahead before Coutinho added his second minutes later. In the 63rd minute Mane exposed Arsenal’s defence before scoring a beauty to register the fourth goal. Arsenal kept their hopes alive for a comeback after scoring through Oxlade Chamberlain and Chambers but the damage had been done as the Liverpool hung on to clinch maximum points.